4 Simple Steps to Start a Family Rosary Group - Pray together in faith. When you hear the word Rosary, what image comes to your mind? Do you think first of an older lady wearing a veil kneeling in church while praying her Rosary, or do you picture kids sitting on the floor together, squirming around as several families have gathered to pray the Rosary together? The second picture is what I think of. 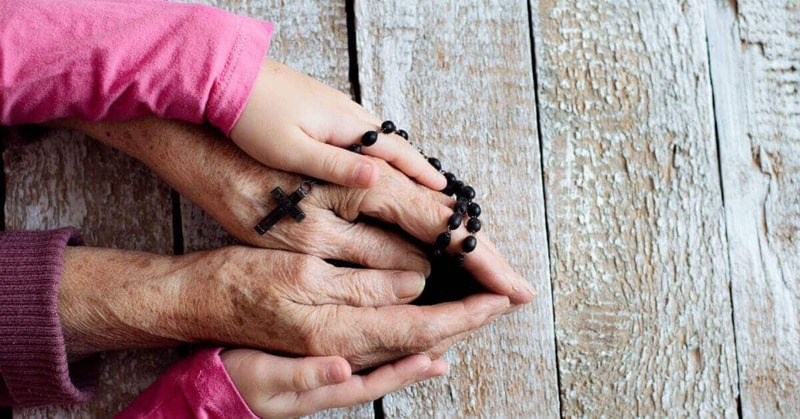 If praying the Rosary more often is something you have been wanting to do with your family, I have a suggestion for you: start a family Rosary group. Being part of a family Rosary group is a fun and meaningful way to get your family involved in praying the Rosary together. Praying with friends is certainly more enjoyable for kids! If you need some guidance on what to do to start one, don’t worry; I’ll explain four simple steps on how to get a family Rosary group started. 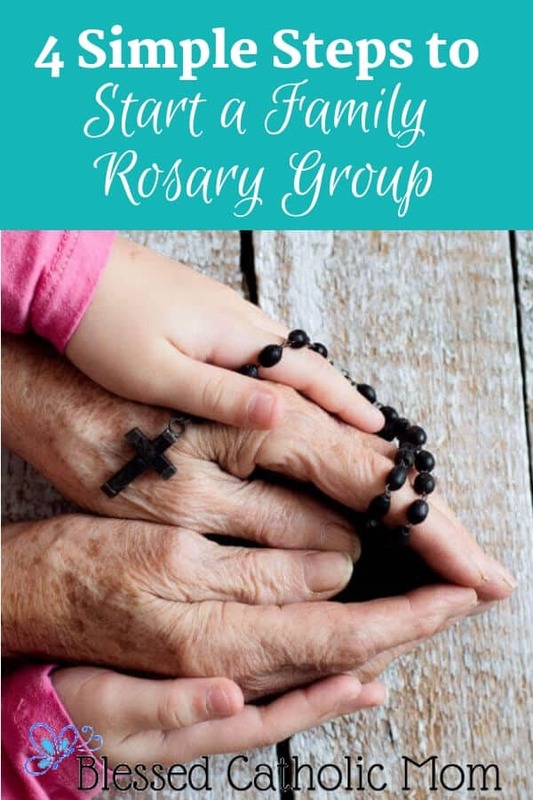 How to start a family Rosary group. 1. Decide how you want it to be. Since you are the one starting this Rosary group, you can decide how you want for it to go. Decide with your spouse how you want the group to be. 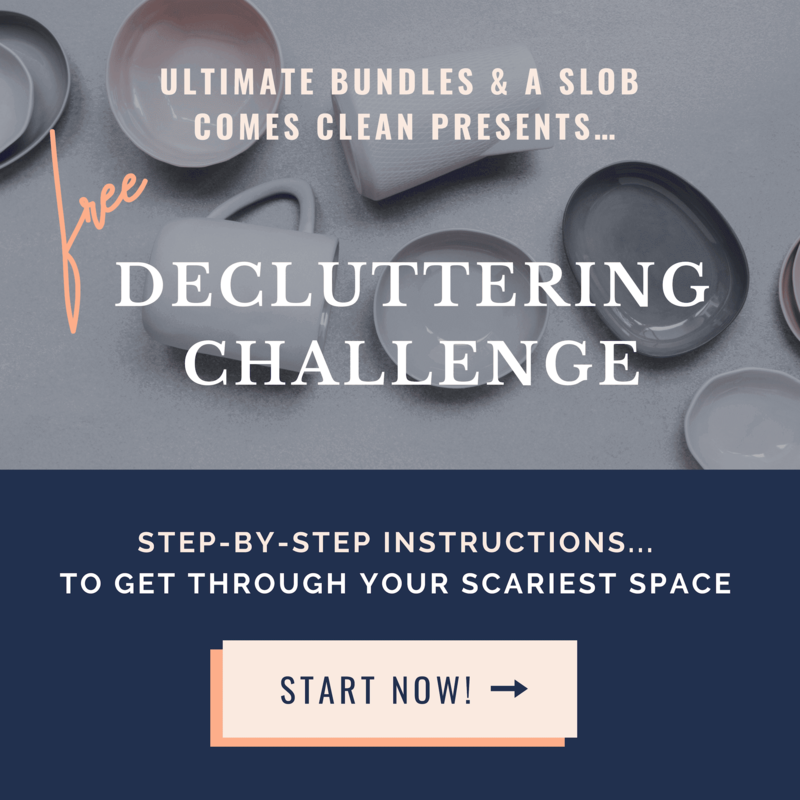 It is very helpful to have a plan in place before you invite other families to join so you can share with them your plans and they will know exactly what they are saying yes or no to being a part of. It would be a group for families. All family members (including nursing babies, squirmy toddlers, and quiet teens) would be invited, not just adults. Meet once a month. We set the date for our first meeting when we had the number of families we wanted. We picked a date that worked for everyone. At our first Rosary group, we discussed as a group what day of the week would work the best for everyone and we set it. We decided to meet every third Monday. Rotate homes. Each family would take turns hosting the Rosary. 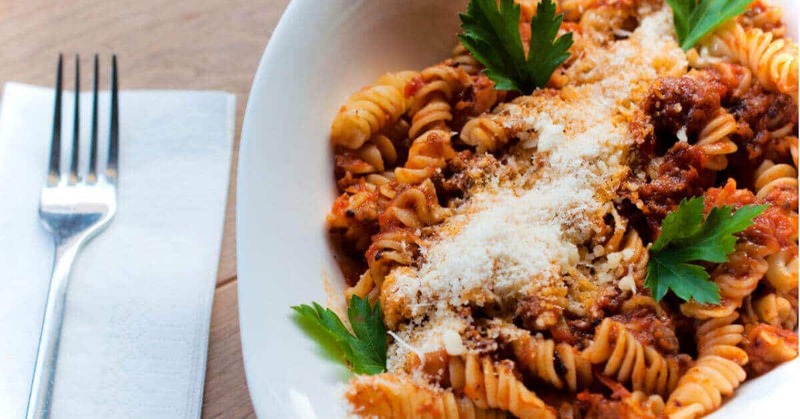 The hosting family served pasta and sauce and provided paper plates, cups, napkins, and cutlery. The other families each brought one thing: bread, salad, drinks, and dessert. We ended up making a schedule so we knew where we would meet each month and who would bring what. Instead of making a schedule, you can also just decide at the end of each Rosary meeting where the next one will be and who will bring what. Have five families in our Rosary group. We didn’t want our group to be too large, especially since each family we invited had three to nine kids. We wanted to all fit in the same room when we prayed together. Having a smaller group helped us to get to know each other better as well. We invited four families, and we were the fifth family. My husband and I had a few families in mind that we wanted to invite to be a part of the Rosary group. Some people we did invite said no, so be prepared to hear no. Don’t take it personally; some people are just not interested in participating. Some couples said yes before we even explained the details of our idea. This surprised us! Others wanted to know more before saying yes or thinking about it. It was fun asking families. The group we started with was not the one we expected we would have when we first had the idea, yet it was just the right group: God brought us all together. We decided to host the first Rosary group gathering at our home. When we gathered, we talked with everyone about our plan for the group and people asked whatever questions they had. Not everyone had the Rosary memorized, so we had little brochures from the Knights of Columbus that had all of the Rosary prayers on them. This was very helpful because then everyone who needed to keep track of what prayers were said when had something to read to follow along as we prayed. 4. Plan how you will pray together. It is up to you how you want to do this. I’ll share here what we did to give you some ideas. Whoever was hosting the group that night would lead the Rosary, announcing each mystery. As we prayed, we usually went around the circle, each person leading one prayer. We helped the youngest kids with leading the prayer when it was their turn. We continued going around the circle repeatedly as we prayed. Other times five different people each lead one decade. The older kids liked doing this; it helped them to really feel a part of the group. Starting a family Rosary group was one of the best things we have done for our family. Over the years we grew in faith with the other families. We shared joys and sorrows, our kids made solid friendships that have lasted, and we learned from each other about faith and life; we supported and encouraged each other. As I mentioned above, my husband and I were inspired to style our Rosary group after the one my parents were a part of. There is one thing that my parents’ group did that we didn’t do. I mention in here in case you are inspired to follow this pattern as well. After meeting together for a year, they disbanded their Rosary group. The plan was for each of the five families to find four new families to each start a new Rosary group with that would stay together for a year, then repeat the process of disbanding and finding new families to pray the Rosary with. The goal was to perpetuate small groups praying the Rosary together. If you want to follow this model, be sure to tell the families you invite that this is your objective so that they know. Now I have a question for you: Are you ready to start a family Rosary group with your family? If you are looking for how to pray the Rosary or for more Rosary resources, you can go to Rosary Center and Confraternity for help and information. The Rosary group that our family belonged to met on Sunday evenings. I was pleasantly surprised when one of our teenaged sons said “That is a really nice way to end our Sunday … our day of prayer.” Twenty years later our children still talk about our Rosary group and the friends we grew in faith with through that group. I would definitely recommend it for your family. Thank you for sharing your experience. Participating in a family Rosary group has lasting, positive effects for our children. I have always wanted to copy you on this. Now I’m feeling motivated! Thank you, Melissa! I am glad you are inspired to start a family Rosary group. I’d love to hear how it is going once you get started.